And how did you not tell me? This is a gorgeous way to spend $90 if you ask me. Groan (says the guy that wasn't going to spend money on modules this month...). So the time has finally come for me to set up a 'business' modular; one that can hold the modules that I need for my Cycling show-and-tell visits, and one that will be easy to ship to my coworkers if/when they need to do the their presentations. I ended up going with a Structure 96, mainly because it is about the right size for almost anything, but partly because it is a limited thing that will force the creation of a very basic system (and one that is focused on Max-integration). To start with, it'll have the ES-8 and a Monome Teletype; eventually, it'll have a little analog voice and probably something like a Maths. It'll be useful to show having both audio/CV in and out running to the computer; this will mean that I could (for example) control my reverb mix using one of the static voltage channels of the Maths. The case should be here on Wednesday; I'll be able to kick the tires a bit at that time. It'll most likely make its debut at the Voltage Connect conference at Berklee (March 10 & 11). If you are there, look me up! For some reason, I woke up at 3am this morning. What does one do at that early hours? Answer #1: play some Kingdom Rush. Answer #2: Work on patch editors for the Novation Circuit. I'd used the Isotonik editor a couple of times and was OK with it, but I thought I'd like the visceral nature of an iPad-based editor. So I went and re-uploaded the Lemur setup (Lemur iPad app, Lemur editor and wedgie thing), then got the two variations of the Circuit editor that was in the User Library. After grinding around with it for a while, I finally got each one working. That's when the troubles began. First of all, I have an iPad Mini, so what might be a normal interface for regular people doesn't at all fit me and my Trans-Atlantic Cable Fingers. Secondly, and they don't tell you ahead of time, there isn't any way to save your work on these editors! There's no way to save a patch on the Circuit itself, and you can't do it through the Lemur editor, either. Grumble, grumble. I thought maybe something might be available via TouchOSC, but the only thing there was an editor made by Novation themselves, and all it shows is the macros for the four voices. Less helpful than no editor at all! 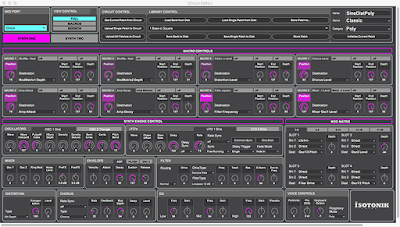 So, I went back to the Isotonik editor with hat in hand, begging forgiveness and working on my distorted sine polysynth that is my current obsession. Got it the way I wanted to, went to upload it to the Circuit, and - ZING! - all of the macros are zeroed out before the patch is sent. I fixed 'em up, and 'smartly' saved the patch to disk - which also zeroed out the macros! Reload the patch, only to see that the patch was saved with zeroed macros, too!!! 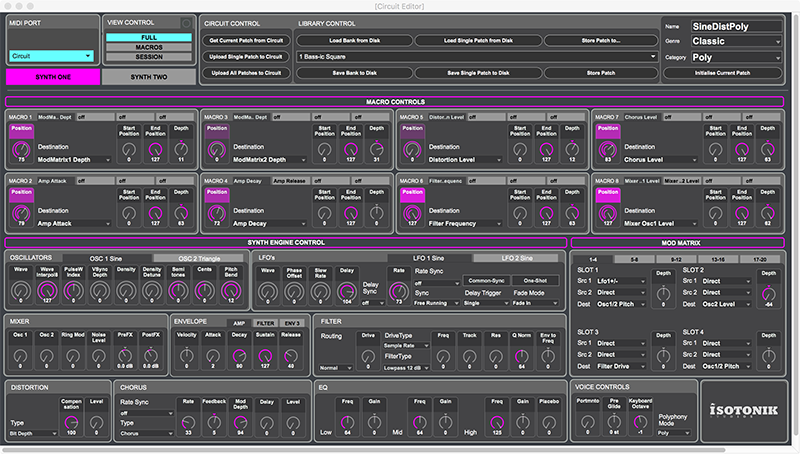 One last try: the Max For Live version of the editor. And you know what? Works perfectly. So now, I have a Live patch (named, of course, CircuitEditorShitholeDammit) that I can use for my editing. Oh, and my sinewave patch? Beauty, baby. Lost an hour (between 7am and 8am) listening to a 3.9375 bar loop (3-and-15/16ths...) endlessly over a 2 bar percussion loop. Bliss. 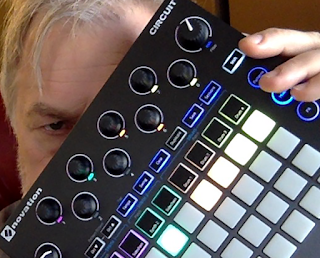 So, a bunch of people that I respect have been using this thing, and I needed something to write about for an upcoming newsletter article, so I Novation'd. I'd been reading about, YouTubing around and generally obsessing about this since I saw that John Keston was using one, and decided that it was worth a go. Came in yesterday's mail, and I had all the right batteries lined up ready to work (although it came with Alkalines, I'm a dedicated rechargeable battery user...), so I spent some time playing last night. And this afternoon. And I'll spend more time with it tonight. 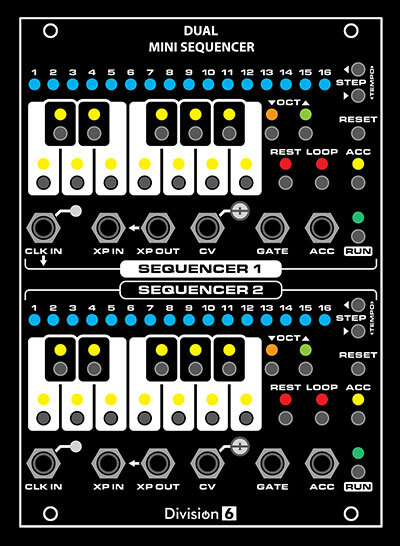 It's a ton of fun, it checks most of the Fun Boxes (the main one unchecked is the 'live sampling/looping' box, but <shrug>), and it both consumes and produces MIDI, so I should be able to integrate it with Ye Olde Modular. 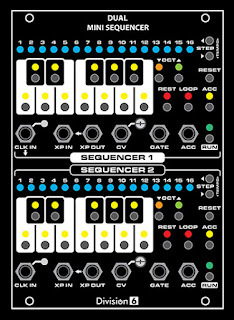 It actually looks like a decent sequencer for the modular - along with something like the Keystep as a front-end for it - and the addition of user-loadable samples means that I can also develop modular drum samples to be used next to my actual modular.